Fantastic deals including $1 specials, pictures with Santa Claus, Bowl and Brew Tournament, raffles, special appearances from DJ Mini Motto. 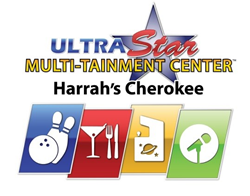 The UltraStar Multi-tainment Center at Harrah’s Cherokee Casino Resort is celebrating its Grand Opening on Saturday, December 2, 2017, with fantastic family friendly deals and raffles throughout the day. In celebration of the facility opening, UltraStar is offering $ for $ matching in the arcade, $1 bowling and $1 shoes. Throughout the day, there will be raffles and special guest appearances from Santa and DJ Mini Motto. The Bowl & Brew tournament will allow guests to enjoy new and different flavors of beer while enjoying a friendly competitive game of bowling. A prize will be awarded to the top three players. The FIRST 500 people to sign up for UltraFun Rewards will receive an UltraStar limited edition wristband with $20 game play and will be entered to win two tickets to Dollywood. Bowl & Brew Tournament in Strikes Lounge for guests 21+ to enjoy and learn about our local craft beers. Cost is $19.95 and includes an UltraStar Pint Glass.